Bannerstands UK is undoubtedly multi functional marketing tools; you can use them in many situations to get additional marketing exposure to your company with minimum cost. You can use them in trade shows, exhibitions, outdoor advertising, and other events making special offers and launching new product or services. Or in other case they can be used in the offices itself to welcome your visitors and greet them to introduce to your company. Largeformat print provides all types of banner stands uk, display designs, hoardings, exhibition graphics to make your brand image in the market. There are few things you need to consider while designing a banner stand for your company. High quality stands are provided by us with great eye catching graphics that may induce the viewers to enquire about the products and services. The banner stands UK are very easy to set up carry from one place to the other with ease. Trade shows and exhibitions are the most important events where you can present your business and showcase your products and services. People get attracted to the designer displays with appealing graphics; they are best used to represent your business in a short and impressive manner. You can make demonstration of your products and services easily with the use of banner displays. 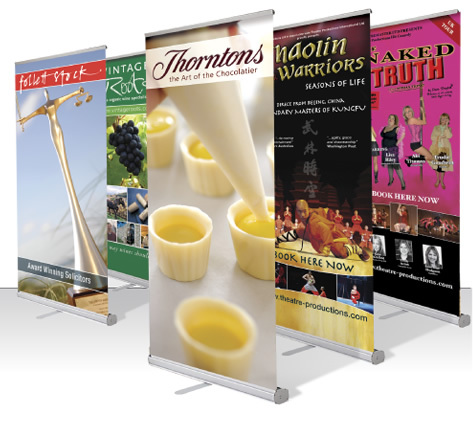 The bannerstands UK provided by us has a hidden potential to make impressive demonstration of your products and services. It is very important to increase your brand awareness among the various competitors in the market.